Tradesman now supplying 3-Inch Ladder Bars! 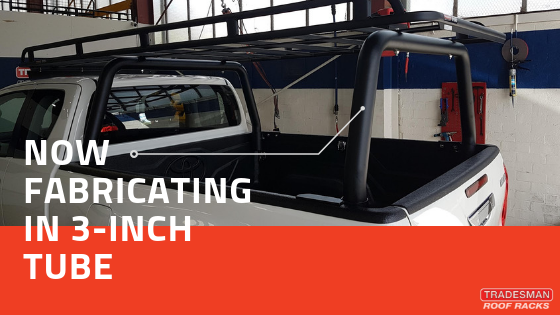 Adding to our ever-increasing range of load-carrying solutions – Tradesman Roof Racks now has the capability to combine our custom roof racks with 3-Inch Ladder Bars. Bought your vehicle without ladder bars and don’t need a roof rack? Tradesman can install ladder bars at any width and height to suit your unique need! Tradesman still offers the 50mm steel tube in addition to our new 3-inch alloy capability. Ladder-bars are the perfect combination with a roof rack as it gives you a flat platform to carry plaster/ladders and so on. These are best measured up in person by a professional installer, so either come and visit us in Bayswater Victoria or Prestons New South Wales or give us a call and we will refer you to our reseller network across Australia.